1. When will Coláiste Chiaráin open? Coláiste Chiaráin will open its doors on 1st September 2017. The new Principal, Brendan Waldron has been appointed and will start on 1st February 2017. 2. How can I enrol my son/daughter into Coláiste Chiaráin? Enrolment forms are available from St Joseph’s Summerhill and St Aloysius College. They can also be found on the website. The closing date for enrolment is 17th February 2017. 3. Where will Coláiste Chiaráin be located? Until the construction of the new build is completed, students will be accommodated in the existing St Joseph’s school, Summerhill, which is in the process of being upgraded. A substantial investment is to be made by the Department of Education and Skills to endeavour to upgrade the existing Summerhill building, and to provide additional accommodation for the interim period. Coláiste Chiaráin will have all the facilities required to ensure the enhanced teaching and learning environment for staff and students. 4. When will the new school commence? The new build has been included in the list of major capital projects for 2018. A schedule of accommodation for the construction of the new school building has been published by the Department of Education and Skills. The appointment of the Design Team is expected shortly. 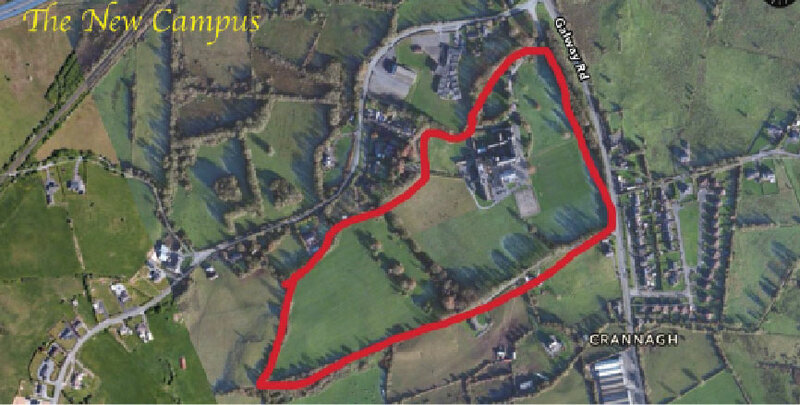 A 28 acre campus setting in a quiet, out of town environment. A new school building to cater for up to 1,000 students. A state of the art Physical Education facility exceeding 1,000 sqm, to include a large gymnasium, fitness suite, 6 hard play courts and numerous pitches. Specialist rooms for Art, Home, Economics, Construction Studies, DCG, Music, Engineering, Technology, etc. 5. Does Coláiste Chiaráin have a uniform? YES, the new uniform is currently being worn in St Joseph’s Summerhill and St Aloysius College. The jumper bears the new crest which was designed to include an input from many local primary schools. Uniforms can be obtained in Burgess, Athlone and Fossal, Athlone. 6. Will there be a school book rental scheme? YES, the current book rental scheme in operation in St Aloysius and St Josephs will continue in September when Coláiste Chiaráin opens. 7. Will there be Bus Transport? YES, the current bus transport arrangements for St Joseph’s Summerhill and St Aloysius College will be continued. We will also be in consultation with Bus Eireann and the DES to improve these existing services. 8. What subjects will be on offer in Coláiste Chiaráin? All students in Junior Cycle will study Irish, English Maths, History, Geography, Science and Religious Education. They will also study Wellbeing: (SPHE, PE, CSPE) and ICT. French, German, Art, Home Economics, Music, Business, Technology, Metalwork, Materials Technology Wood and Technical Graphics. 9. How will Coláiste Chiaráin assist students in their transition from Primary to Secondary school? A Transition to Secondary Programme in April: evening activities to introduce incoming students to the school and new subjects. An Open Day and assessment in May. 11. Can I make an appointment to discuss enrolment? YES, contact us at 090 649 2383 to make an appointment with the Principal, Mr Brendan Waldron.